As I have said before, New Jersey has a bad reputation to being dull and ugly industrial landscape whose population is either gangsters or commuters into the city of New York. My initial impression of New Jersey hadn’t been much better. When I first arrived all I saw was the crowded highways that seemed to be falling apart into a potholed mess and the strip-malls with typical fast-food chain restaurants. I spent my weekends fleeing New Jersey, off to New York City, Washington or Boston. Over time, though, my impressions of New Jersey started to change. I got off the highways and started to explore the back roads of the Meadowlands area, and found interesting slices of small-town America mixed with the urbanity of a big city. Grand, turn of the century homes sit down the street from newly built condos. Quiet suburban streets lead to busy main boulevards where Asian-fusion restaurants coexist with greasy spoons. If Rutherford and the Meadowlands area was more than what it seemed, though, what else might exist in that small, brown strip of dirt that the New Yorker cover showed? During a meeting last week, I expressed my interest in exploring a little more of New Jersey, perhaps getting out and seeing some of the outdoor sites in the state. Jim, an employee of my client who had just moved to New Jersey from Michigan expressed an interest in doing the same, so on Saturday we set out to see what wilds New Jersey would hold for us. We first went to Mount Tammany in western New Jersey. 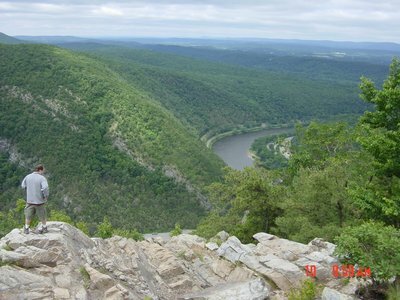 Mount Tammany is the southern most peak of the Kittatinny Mountains, and overlooks the Delaware Water Gap, a mountain pass where the Delaware River passes through the Appalachian Mountains. The Delaware River serves as the border between New Jersey and Pennsylvania. 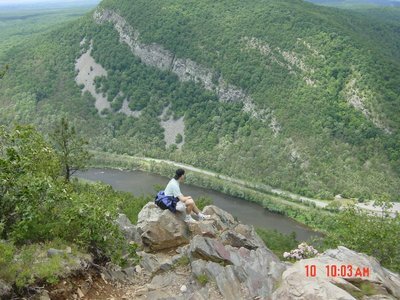 There are a number of Mount Tammany hiking trails. We followed the Appalachian trail until we hit the blue blaze trail, which climbs 1200 feet from the river up to the top of Mount Tammany. Atop Tammany, we paused to take in the view and have a lunch of peanut butter and jelly sandwiches and bottled water. As Jim and I ate lunch, we swapped stories of our lives and adventures. Jim told me how me migrated from Aspen to Indiana to California and then across the country to wind up in New Jersey. I told Jim of my adventure on Mount Kilimanjaro and my bout with altitude sickness. "I feel sorry that you didn’t make it to the top of Kilimanjaro," Jim said, after I related the story of having to quit after the fourth day and come down the mountain. "I don’t mind," I said. "After all, the story of being bounced down the mountain on a stretcher makes a much better story than reaching the summit and coming down without any issues." 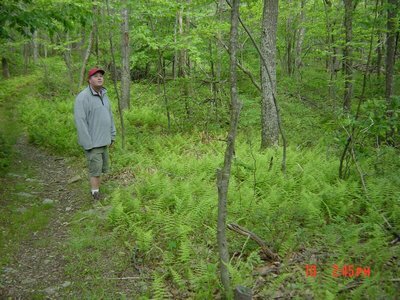 After lunch, Jim and I headed down the Red Dot trail. About 15 minutes after leaving the top, we rounded a corner and saw 3 people standing around a teenaged boy wrapped in a tarp. "Is everything okay?" Jim asked. "He hurt his leg," one of the people said. One of the three bystanders was an EMT who had happened upon the scene. She had helped the boy as she could, and they were waiting for evacuation off the mountain from the rescue crew. They assured us that there was nothing that they needed, and that we were fine to move on. Before we left, Jim pointed at me and told the group that I had to be evacuated off Mount Kilimanjaro. Jim spoke to the boy and said, "Greg says that it’s a great story to tell, so the good part about all this is that after it’s all over you’ll have a great story to tell." We stepped carefully the next few miles, afraid of twisting our ankles. The round-trip hike was about a 4 1/2 mile hike with a vertical climb and then descent of 1,200 feet. We arrived back at the car, and it was only half past one in the afternoon. "Want to go to the highest point in all of New Jersey?" Jim asked. How could I say no? High Point State Park, in the state’s north-west corner, contains the highest point in all of New Jersey at 1,803 feet above sea level. There is an obelisk at the site that rises another 220 feet that you can climb and see views off in all directions. A young boy, upon arriving at the monument said, "it’s not a big as the Washington Monument," which it does look very much like. After climbing the monument, Jim and I headed off on the circular Monument trail. The monument trail is a gentle hike of 3 1/2 miles, which was good for my legs that were getting a bit rubbery after climbing up and down 1,200 feet back at Mount Tammany. The trail provides beautiful views of the Delaware River and the valleys below in Pennsylvania, New York State and New Jersey. This is usually the point of the blog entry where there is some conclusion. I really have none. At least not one that’s very snappy. Oh well.